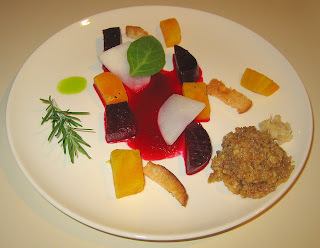 From last week's beet appetizer, I had some of the beet reduction left. I had the idea to make mashed potatoes and mix the reduction in. I also mixed in about half of a small shallot, diced to about 1/4" x 3/8" pieces, Earth Balance margarine, and salt, and I garnished it with a chive sprig. It ended up tasting quite remarkable, better and different than I had imagined. I'm at a loss of words to characterize the flavor, but it was like a rich mashed potato with a strong overtone of some other appealing flavor, not of beet. Wow! I also reheated the grilled vegetables from last Thursday and grilled corn on the gas range. As usual, I mixed in fresh lime, Earth Balance, and salt; I also added in about a quarter of a jalapeno pepper, diced to less than 1/4" cubes. I had to go back to the July 19th blog entry to remember that the cracker I served is a low-fat (and delicious!) millet and flax garlic "chip". I have to figure out where I purchased it from as I want to make it a regular in my pantry! When class ended today, I found that none of my students were joining me for dinner, and my wife was also not planning on coming. So I just came home for home-cooking. Today was rakhi, an Indian ceremony uniting brothers and sisters; an aunt and cousins take the role of sisters for me and send colorful stringed ornaments for wearing on the wrist. We had a celebration at my parents' house, so it was almost 11p by the time I came home. My wife had eaten earlier at my parents', so I made a simple dinner for myself. I grilled a Garden Herb Organic Sunshine Burger and served it on toasted lemon rosemary bread, along with a little pesto sauce, a touch of ketchup, and some onion. I also made some potatoes O'Brien (I had purchased frozen and just had to cook it in some oil in my cast iron pan). It was a simple but good and filling dinner. I had beet juice leftover from the beet appetizer that I had made last week. 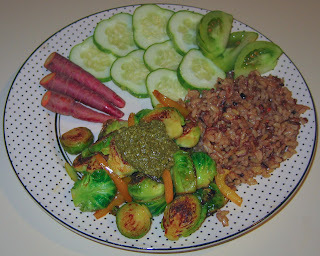 I set some mixed brown and wild rice to cook with a vegan bouillon cube and also made a simple saute of about a dozen Brussels sprouts; half of a red onion, diced into approximately 1/2" x 1/4" pieces; and, when it was almost done, a small, finely diced shallot as well as a third of a jalapeno pepper cut into thin 1/2" slices. I mixed in a little salt and pepper. When the rice was done, I mixed in the 1/2 cup or so of beet juice that I had, along with the vegetables and 2 teaspoons or so of purchased prepared horesradish. 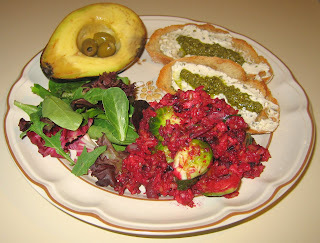 I served the colorful rice with two lightly toasted pieces of lemon sourdough bread. I put some chive vegan "cream cheese" (from Isle of Bute foods in Scotland) on (skipping on my wife's plate, as she doesn't tolerate fractionated soy very well) the toasts, then ran a line of pesto down the center. The rice was good and striking! I loved the toast. On Saturday, we went to the 12th annual NC Gay and Lesbian Film Festival to see an interesting film, Nina's Heavenly Delights, about an Indo-Scottish family who run an award-winning Indian restaurant. 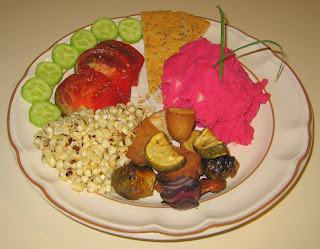 We decided after that to take it easy and eat out; we had an uninspiring dinner (salad, roasted vegetables with hummus (?! ), potatoes and asparagus, vegan pesto, and a good lemon sorbet) at Tosca Ristorante nearby in downtown Durham. Yesterday, we went to a nice jazz concert featuring Boney James, Joe Sample, Michael Franks, and several other groups. We left around 9p and again decided to eat out, getting to Tower South Indian retaurant just in time to eat before they closed; we shared some lemon rice, uttapam, and plantain bhaji. So much eating out! And tomorrow it is likely South Indian food again after my photography class, the last of six in Cary, NC. As I had mentioned last weekend, I purchased some Indian-fusion bottled tomato sauce from a local company named InFusion Foods. The sauce contains "tomatoes, onions, peanut-oil, garlic, salt, oregano, red chili powder, cumin, coriander". I made a simple pasta dish by using seashell-shaped organic pasta made at the Montebello Monastery in Marche, Italy. In another pan, I briefly (maybe for 2 minutes) sauteed over medium heat small chunks of a quarter Anaheim pepper, a red onion, and a quarter yellow onion. Then I added the sauce and simmered over low heat. When I was ready to serve, I first mixed in about a dozen small fresh oregano leaves. I boiled and then drained the pasta, rinsing it with cool water. 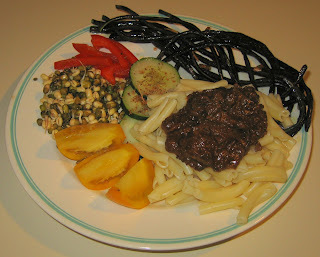 I served the pasta with the sauce, as well as with a salad and sauteed tempeh strips. It was good but my original hunch about the sauce's being too runny proved to be true. I'd enjoy working with these sauces again, but perhaps would mix in some tomato paste or slow-cooked eggplant. The taste, in any case, was interesting but lacked the punch of a fuller tomato sauce. I've never grilled before; my wife won from work a little 14.5" Weber "Smokey Joe" grill, so now is a good time to learn! I started by soaking hickory wood chips and seven wooden skewers in water for about a half hour; the chips put on hot coals add a nice hickory smoke flavor. I had forgotten, but had also wanted to soak several stalks of rosemary for similar purpose - I ended up soaking the rosemary for just five minutes or so. I put about two dozen little briquets of easily lit charcoal in a pyramid in the bottom portion of the grill and lit them about twenty minutes later; true to instructions, it just took about ten minutes for the coals to get white-grey hot. My wife then used a stick to spread out the coal into a single layer, and we covered it with the grill top, with all the vents open. I prepared the kabobs by soaking in about a half or more bottle of Baja Lime marinade chunks of seitan (I used a whole box), a small eggplant, and half of a red onion; slices of two small fingerling potatoes, a third of a zucchini; a small tomatilla, quatered; and, one to a skewer, whole Brussels sprouts. The potato may not have been a good choice as it may not be done when the other items are; the tomatilla (actually, the whole grilling experiment!) was a trial - my wife picked tomatillas up recently and I've never cooked with them, though I know they make good sauces; and the Brussels sprouts were difficult to push on the skwerers. We let the kabobs go for about 25 minutes, then I turned them over. They've been cooking for about 10 more minutes and I'm about to boil some rice noodles for just 2 minutes, put them on the plates (where I've already served the remaining beets from the beet salad I've made recently, as well as heirloom tomato with spinach), and serve the kabobs atop the noodles. Grilling was a success! I ended up cooking the kabobs for 25 minutes after flipping, so 25x2 = 50 minutes. The heat didn't seem so high; I wonder if I needed more charcoal (there was still some left after I was done and closed the dampers, cooling the grill down fairly quickly). The seitan was great! The potato wasn't done - I should have sliced it thinner. Everything else was quite good. 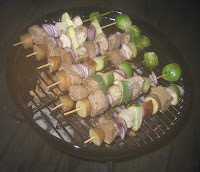 Next time, I may want to baste the kabobs when I turn them over, but they were still quite good and fine not basted. We had friends over for dinner tonight. They're a kind young couple who have been dating for a few months. I felt bad because when I invite people over, I like to have everything done or almost done and ready to serve when they arrive, but today I was out much of the afternoon and early evening, so arrived back home around the time that they arrived to hear my wife teaching sitar. But we all enjoyed the evening! I had ingredients left from Friday's beet salad, and made it again. 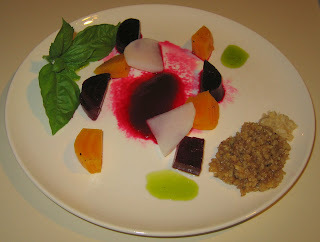 I was thinking that I might cook the beet reduction down more, but given the time, I instead put it, as well as the plates, in the freezer for a half hour or so. That didn't do the trick; the reduction was runnier than on Friday and the plates didn't look as attractive. But it tasted good! For the main course, I cut a medium Vidalia onion into half moons then cut those half moons into fourths. I started sauteeing the onion in olive oil over medium heat just a minute or two till they started turning clear, then added a package of tempeh, cut into small rectangles. After five-seven minutes or so when the tempeh started to brown, I added a plantain, cut into 1/4" discs then halved, and most of a medium-large zucchini that I had cut similarly. A few minutes later, I added a small shallot, finely diced, and a small red bell pepper, cut into thin strips maybe 1/4" x 3/4". I mixed in Baja Lime marinade and salt, turned the heat off, and let it sit for about five minutes before serving. 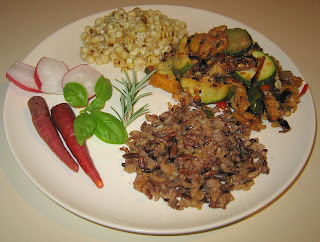 I also served a brown and wild rice mixture and corn off the cob. Last night we ended up having a very nice anniversary dining experience at Il Palio in Chapel Hill, one of our favorite Italian restaurants. It was a $100+ dinner for the two of us, but then it was our anniversary and it was fine dining - and I even had a glass of champagne. As we have come to expect from this restaurant, the food was very tasty - a starter of a small cup of red bell pepper broth (they knew we were coming so had many vegan items on hand), appetizers of risotto and focaccia, and main courses of pasta (the only disappointment; it was good but the pasta was too soft) and grilled vegetables. Today I had photography class, but my wife didn't want to drive out to Cary, NC to meet me and none of my students joined me. A colleague who wanted to discuss a seminar I am offering this fall had planned on meeting me but even he didn't show up. I've been eating out a lot, so I came home and put together a quick meal for myself (my wife had some quick Indian food that she had put together for herself). 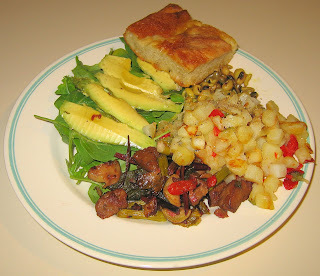 I made potatoes O'Brien and heated leftovers - Limed Red Beet Green Saute, black-eyed peas that my wife had made, and foccacia from last night. Yesterday evening we went to a nice housewarming party of a young vegan couple nearby and enjoyed a variety of picnic foods, including amazing lime sorbet, "ice cream" cake, Binge Cafe's delicious "ice cream" cake, and super peach cobbler and chocolate cake. Vegans sure eat well! My wife and I were out all day and ended up in Pittsboro, NC, where we took a look at the 1-year-old Chatham Marketplace cooperative. It was a good place with a nice renovated mill atmosphere. 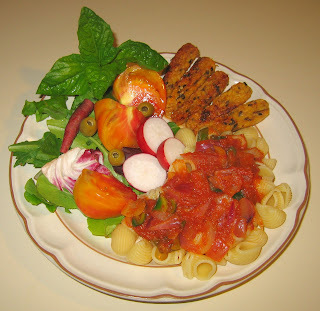 We had a salad and did some shopping, including finding an interesting line of products, blending Indian tastes with Italian, called InFusion Foods; we bought a tomato sauce with Indian spices that, though it looks quite runny, I'm anxious to try. Anyway, we got home around 10:30p and my wife was tired and anxious to eat, so I got to work and put dinner on the table in about 40 minutes. I grilled asparagus spears in some Mongolian Fire oil then ceded the pan to a small Vidalia onion that I had diced (approx. 1/4" cubes); to keep it hot, I put the cooked asparagus in my toaster oven at a mild temperature. I also added some olive oil to the pan and, a few minutes after the onions were cooking and when they were starting to clear, I added the stalks, cut into 1" lengths, from the Golden beet greens left from my Friday beet extravaganza. Once the stalks softened, maybe in 5 minutes or so, I added the hand torn-off beet leaves, coarsely hand-torn into quarters, as well as a small organic red seeded and diced (maybe 1/8" x 1/2") jalapeno. I had some rice noodles soaking in very hot tap water in a bowl till the noodles were soft (then I washed them with cold water and drained them); I added the noodles as well, plus Baja Lime marinade and salt. I had some prepared pesto potatoes that I had purchased, and served them. 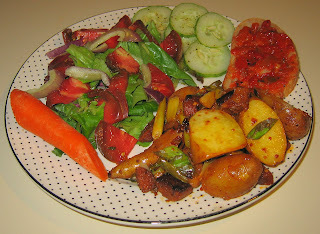 The simple salad included a topping of walnut oil. Not bad for 40 minutes, huh?! Café Parizäde, where they know us well and where we have our annual Thanksgiving? The area's only AAA five-diamond restaurant, The Fearrington House Restaurant? - no, they're closed tomorrow. Maybe the new upscale Herons at The Umstead Luxury Hotel and Spa? - but it looks like they have a decidedly flesh menu. Il Palio in Chapel Hill? My friend, Linda Long, is a vegan food photographer and writer; I first met her when she wrote a feature magazine article on our famous Thanksgiving, the biggest vegetarian (all vegan) such event in the country for a few years now. I was honored that she asked me to test a recipe for a book that is expected to be published in the autumn of 2008 by Gibbs Smith, Publisher, Great Chefs Cook Vegan. She is asking top chefs around the country to each submit a gourmet vegan recipe; as she told me, each "was asked to give an entire 3-4 course meal, a full vegan menu that could be served in their high-end restaurants if a vegan came in with their non-vegan friends. There are 25 chefs in the book and over 100 recipes and photographs." I was given Chef Daniel Boulud's recipe for Beet Salad with Red Beet Reduction, Walnut Chutney, Arugula, and Horseradish, served with chive oil. Chef Daniel has won many awards including being named New York City's top Chef, been on many TV and radio programs, written numerous cookbooks, and is well known for his restaurants. This was perhaps the most challenging dish I've made and took me about four hours! It sure was impressive when it was done - other than my goof at not having the beet reduction be thicker (it wasn't to have run but was to make a nice rectangle; compounding the issue, I forgot one step of the recipe, that of chilling the plates), most everything from the croutons to the chive oil and beets were very tasty and beautiful. I hope to post more details on how I made this soon. We had a friend of my wife's and her husband visiting us for dinner tonight. In addition to the appetizer (which was rich and filling - oh, that walnut chutney was great! 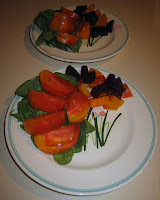 ), I made a much simpler, and relatively small, main course, using the red beet tops. I didn't use onions because my wife's friend is pregnant and having problems eating them. What I did was saute approximately 3/4" chunks of seitan in olive oil for 4 or 5 minutes over medium-high heat. When the seitan started browning, I added the beet stems (I had hand-torn the leaves off, then roughly hand-cut the leaves each into three or four pieces), cut into 1" lengths. I let that cook, stirring occasionally, for another 3 or 4 minutes, then added a half dozen Brussels sprouts, cut into small eights, small pieces of a quarter red bell pepper, about ten asparagus spears, cut into approximately 1" lengths, and, a minute later, the beet leaves. As the beet leaves cooked down a little, I added organic Baja Lime marinade and salt, then served with heirloom tomatoes (including our newly discovered lemon tomato), baby carrot, and mixed brown rices. We all enjoyed dinner! Yesterday I was going to prepare a quick meal; I had errands to do and my wife had another friend visiting, also, coincidentally, from Charlotte. I had left my cell phone in the car and she became hungry, so left me a message that they were eating out. I got the message in time to meet them; we had another nice meal at Sage Vegetarian Restaurant, including sharing their great Persian lentil soup, osh, as well as eggplant and our favorite, pomegranate reduction with tempeh. I felt bad about missing signals as I would have preferred making a nice meal at home, but, of course, the Sage dishes were a treat! My parents are from India and today is India's 60th anniversary of independence! Can you see the white, green, and orange, the colors of India's flag, in today's dinner? 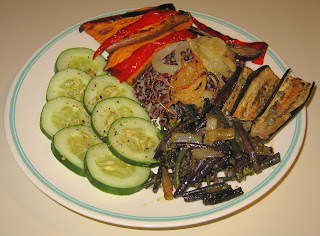 I cut eggplant and sweet potato into thin slices, less than 1/2". I also cut 1/2" rounds from about a third of an onion. I put the vegetables on a cookie sheet that I had first sprayed with a little bit of olive oil, then I sprayed a bit on top of the vegetables. I roasted the vegetables, flipping them once about halfway through, in my preheated 375°F oven for about 35-40 minutes. 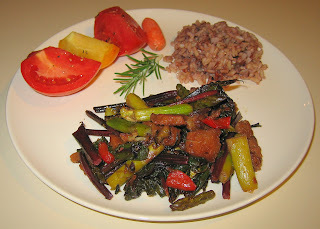 I served the vegetables with red rice (ratio of 1:3 water; I included a vegan bouillon cube and a little salt). I also made a nice bean dish. I had some of the red/purple string beans left from my wife's farmer's market purchase. I started a little onion sauteeing and added the beans, cut into 1" pieces. I let it cook for about 5 minutes, then removed the beans to a bowl. I added a little salt and freshly ground black pepper, as well as a teaspoon and a half or so of pesto sauce. We both enjoyed the meal! Yesterday, after my Cary, NC photography class, several students, a student's spouse, several friends, my wife, and I went out to eat at Udupi South Indian restaurant, very close to where I teach. I had their spring masala dosa; for some reason, my wife and I have found that their food isn't up to par the past few visits we've had there. We had some leftover pomegranate reduction with tempeh leftover from our tasty dinner Thursday after class at Sage Vegetarian Restaurant. For dinner tonight, I heated it up and served it over Strozzapreti pasta. Yum! 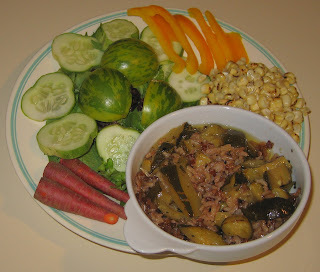 On Saturday, my wife had picked up from the farmer's market some long purplish-red beans. I think they are called red string beans, though I'm not sure. 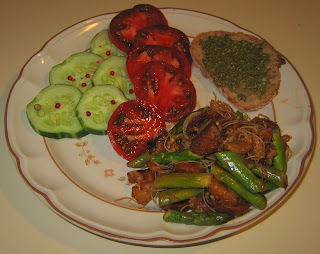 I prepared them similarly to the Tuscan way that I prepare green beans, but I also used garlic. I cut some thin slivers of one clove of garlic and put that in olive oil over medium-high heat for a minute or so, then added the uncut beans. I cooked for a few minutes, then added fresh lemon juice, salt, and freshly ground black pepper. 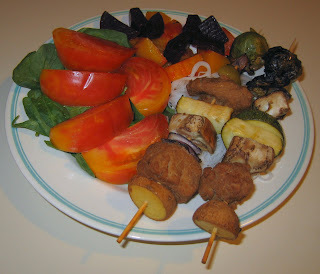 I also served sprouts, cucumber with jerk seasoning, bell pepper, and "lemon tomato". This weekend, we had a fun potluck dinner on Saturday, for which I prepared a quinoa dish with various vegetables. We had my wife's very nice cousin from Wisconsin and her family visiting; they arrived after midnight Saturday night. Unfortunately, I didn't get to make any dinners for them; to optimize their one evening with us, after spending all day (after my brunch that I did make) sightseeing, we ate out at Panzanella Restaurant, which seems to regularly carry vegan pesto - I love their pesto pizza, which is what I always get there. My wife had purchased some good looking fingerling potatoes from the farmer's market last weekend, and the look at them inspired this idea. I simply cut a half dozen of the potatoes into large chunks, roughly thirds, and began sauteeing them for a few minutes, after which I added a shallot, chopped finely. When the potato seemed just barely cooked through, maybe after 7 minutes, I added about five scallions, cut into 3/4" lengths, and medium chunks of spicy Mexican Chipotle "sausage" by the Field Roast Grain Meat Company. After a few minutes when the sausage was browned, I added a half dozen freshly picked basil leaves, roughly sliced into thirds, and perhaps 2 tablespoons of Consorzio organic Baja Lime marinade, as well as salt. It tasted great! Dinner was rounded out with a big salad and, topped with red pepper pinjera spread, bread. Yesterday after photography class, a friend and one of the students joined my wife and me for dinner at all-vegetarian Sage Cafe. I seem to always get their pomegranate reduction with tempeh over brown rice, and last night all but my student ordered it - yum! I was out at the nearby Apple store looking at the new 24" iMac that was just announced yesterday (it's elegant, powerful, and fun, but I wish it didn't have such a glossy screen) and got home to a hungry wife - and I was anxious to eat, too! I almost never eat frozen dinners, but did purchase a small individual serving of Amy's vegan roasted vegetable pizza a few days ago just for situations like tonight. I simply preheated the oven, sprayed a little olive oil on the bottom of the pizza, and baked it for about 10 minutes. 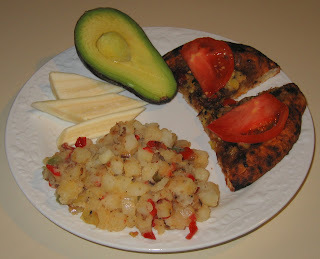 I served the pizza with fresh slices of heirloom tomatoes, avocado, and parsnip. I also tried a variation on the "French fry method" of conditioning my new paella pan and cooked potatoes O'Brien in that pan (and later continued putting the pan, lightly greased with canola oil, over low heat for an hour or so; it's turning a nice brown inside). Yesterday, we went out to eat South Indian food (I had rava masala dosa and my wife had vegetable uttapam; we shared pakoras) at Udupi Restaurant near where I teach photography in Cary, NC. Tomorrow is the last of the six-week photography classes in Carrboro, NC, and we'll eat out in Chapel Hill or Carrboro. French lentils are tasty, nutritious, and easy to cook with; simply add 3 times water or broth to lentils, bring to a boil, and then, over low heat, simmer, covered, for 30-45 minutes till done to the level of softness you want. To make them more interesting, I always first start with sauteeing some vegetables, add some spices, then add the liquid and lentils. I'm overdue as I've not cooked with French lentils since the New Year's dinner that I prepared for my parents. So, I just chopped half of a large shallot into small cubes (less than 1/4"), maybe a quarter cup of eggplant into 1/4" cubes, a medium green bell pepper into thin 1/2" strips, and a half red jalapeno into small cubes. I started the shallot and eggplant sauteeing and a few minutes later, when the eggplant started turning clear, added the bell pepper, sauteeing for another minute or so. Then, I added maybe 2/3 cup lentils and three times as much water, as well as a cube of vegan bouillon, a little salt and freshly ground black pepper (I am switching to using more black instead of pink peppercorns - I am finding that pink peppercorns are usually too soft to grind well, and are great just tossed into food as is), as well as a pinch of turmeric. If I had remembered in time, I would have also added a half teaspoon or so of cumin to the last 30 seconds of the saute. The lentils were fairly soft after a half hour and there was still liquid left; it will be good to store the leftovers and my wife may be able to enjoy it as a dhal soup for lunch. 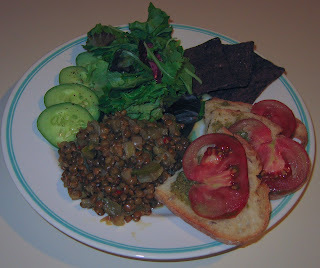 The lentils tasted great and I only wish I had included more eggplant. 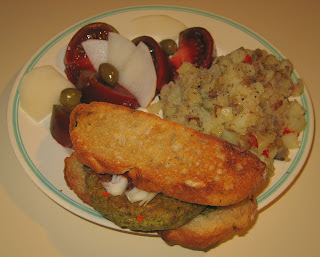 I served several slices of lemon rosemary bread with a thin coating of pesto sauce and thin heirloom tomato slices. Also, as an unusual precursor to dessert, I included a new product that I just discovered thanks to a friend (and blog reader - Hi, Ken! ), FoodShouldTasteGood's Chocolate Chip tortilla chip! It's tasty and the chocolate and corn go surprisingly well together. Yesterday, we went to an excellent program about Baba Amte and his family, amazing people who, for three generations, have selflessly given up wealth to live simply and serve the needs of remote tribal people in Central India (you can see my photo coverage online with additional details). They had some good South Indian idli rice cakes and other dishes that essentially became our dinner, though I made a salad for ourselves when we got home. My wife's film presentation, on a man working to improve the quantity and quality of green spaces in our town, went well! I enjoyed seeing all of the 14 films that the week-long workshop generated. Before the screening, my wife had picked up some items from our town's farmer's market, including rainbow chard. As seems to be the case several times recently, we had just a little time to have dinner. We came home from the screening with my wife hungry, so we had a significant snack/lunch in the mid-afternoon. We were going to the art museum for another film (Shut Up & Sing; other than some strong language, good to see, even if you're not a country fan) and took some new Servas friends of ours who just arrived yesterday from Argentina. So I quickly put together a saute of chard, adding soaked then drained rice noodles and some hot sauce for the last minute. It was surprisingly very good! 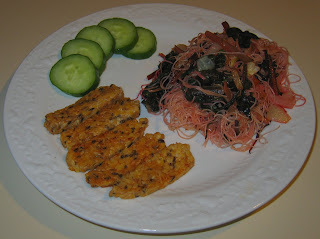 I served it with sauteed tempeh. Tonight, I had to make dinner quickly as I was running late for a film outdoors at the art museum (Dreamgirls - good music and dance). I cooked, ate, and wrapped a second plate to drop off for my wife who had a last late night getting her film ready to present tomorrow. I made a simple Brussels sprout saute with bell peppers and served it with pesto sauce and a side of a brown rice mixture. Yesterday, after my photography class, I drove to near where my wife was working on her film at Duke and picked up dinner from the restaurant where we have our annual Thanksgiving, Cafe Parizäde. They know us well over there and my wife just called to tell them I'll be picking up dinner, giving their excellent chef, our friend Robert Adams, freedom to make anything he wanted. He put together a curried grain and vegetable dish which my wife really liked and another dish that I particularly liked (which I'm forgetting at the moment). I had eaten, posted to the blog, and was on a VUNA conference call when my wife called to say that in fact she hadn't eaten! So I put a quick meal together for her; she is working hard on her documentary film class and will come home, hungry, sometime after 11p. I had some leftover grilled zucchini from a few weeks ago, and simply mixed in leftover rice from last week and heated it in my toaster oven. My wife loves salads, so I made a big one for her. When she arrives, I will simply roast another ear of corn (I had purchased two, luckily, earlier today), take the picture, and serve her meal. I was shopping today and couldn't resist the fabulous-looking large morel mushrooms. Even at $30/pound (! and I wonder if they undercharged as I seem to remember that the sign read $50/pound! ), the mushrooms are so rich that it just took .15 pounds ($4.50), 2 large and 2 medium ones, for my one large serving. I simply sauteed 1/4 of a small onion, sliced, and a few minutes later added the morels, chopped into thirds or quarters. After about two minutes, I served them just with a little salt - yum! 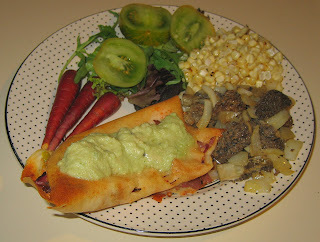 I also had leftover spring masala dosa from Monday night, which I heated. I roasted an ear of corn over my gas range's flame, stripped the kernels, and served it, as I have often been doing, with Earth Balance margarine, fresh lemon juice, and salt. Some baby red carrots, heirloom tomatoes, and salad greens rounded out the meal - just for me tonight as my wife is in class. Tonight I had the challenge of putting together a very quick dinner. My wife has been taking an interesting, intensive class on documentary film making that started this past Saturday for seven days, typically going 9a-9p and beyond. She has been eating with her classmates and I was out teaching tonight and thought that I would cook for myself when I got home. I was surprised to hear that she was so caught up in the course that she didn't take a dinner break so when I got home around 9:30p, I had to quickly get dinner for both or us ready. I was thinking of heating up the leftover spring masala dosa from yesterday; my parents and I ate out at Tower South Indian Restaurant to celebrate my Mom's birthday. Instead, I made a simple saute, starting with eggplant cubes. A few minutes later, I added onion and chunks of artisanal vegan Mexican Chipotle "sausage" by the Field Roast Grain Meat Company; I had originally thought of tempeh, but I was out. This is a spicy product and I purchased it thinking I'd chunk it into some pasta sauce. 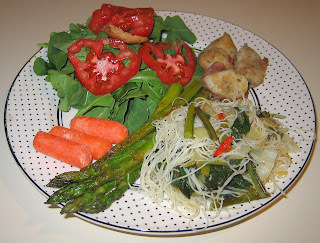 A few minutes later, I added fine rice noodles that I had first soaked in hot water for 10 minutes or so then rinsed in cold water and drained, as well as approximately inch-long pieces of asparagus. I sauteed it all just a few minutes longer, adding small cubes of fresh ginger at the end as well as a little hot sauce. Served with a slice of toast with pesto sauce, it turned out to be a good dinner!